This micro spinning band distillation system is a very powerful tool for separating close boiling components. 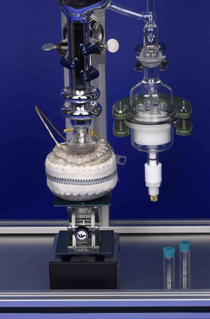 Vacuum distillations can be carried out to as low as 0.1 mm Hg. Special glassware allows receivers to be changed without interrupting the vacuum regulation. 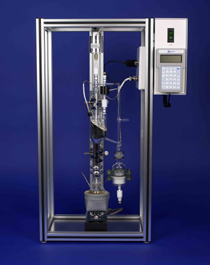 All our distillation equipment is available in fully automatic or manually operated models. Manually operated distillation systems are inexpensive and simple to operate. Automatic models are microprocessor controlled. All the distillation functions are fully automated to make the distillation process easy and efficient from beginning to end. The controller allows easy editing of parameters while the distillation is in progress. Or run the distillation from a PC. Materials that have very high boiling points or are subject to thermal degradation should be distilled at reduced pressures. 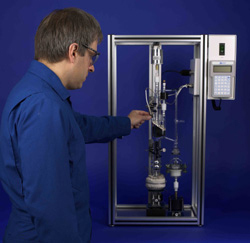 The VAC-1000 is a complete, stand alone vacuum system that can provide regulated vacuum to any distillation system. It features a 5 decade pressure sensor, proportional control valve, vacuum manifold/trap, 2 stage mechanical pump, all mounted on a roll around cart for easy maneuverability in the laboratory. The VAC-1000 can be used with automated or manually operated columns. Five place fraction collectors are available. Receiver sizes are 2 ml. The fraction collector is a convenient way to collect fractions without having to change receivers. The 800 micro still is mounted in an open frame support structure. The open frame allows easy access to all areas of the distillation column. The distillation column, microprocessor and fraction collectors are mounted in the framework. The distillation equipment requires cooling for the column condenser. Cold tap water can be easily attached to the column's condenser. B/R offers heated and refrigerated recirculating baths for more precise control of the condenser temperature.